Left - TWO-HANDLED bridges gap between C.G. and Stretch Glass. $45. Wroda Auction 8-11. Middle - White TWO-HANDLED-JIP Vase 8 in. tall. 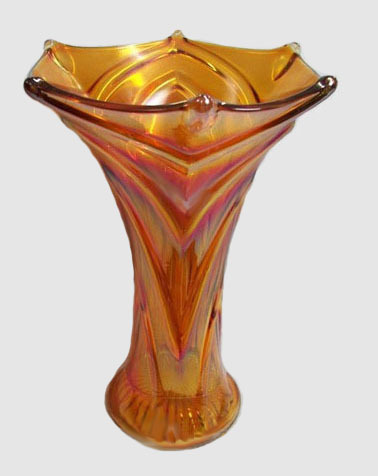 TWO-HANDLED Vase: Appearing in the 1927 edition of Butler Bros. Wholesale Catalog verifies the “bridge-over” between carnival glass and stretch glass. 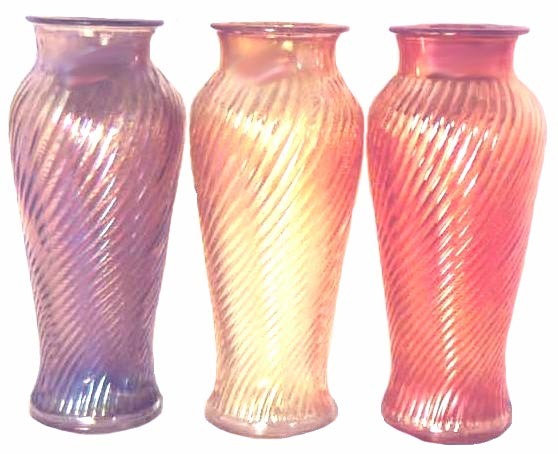 Some of these vases offer a carnival luster, while others extend the onion-skin effect found on stretch glass. Somewhat scarce, they are known in four shapes. Most commonly found, are the 7” tall version having a rolled down top rim. Another type stands 8” tall with a more cone-like shape. The 8” tall vase having a flared, or fan shape top is more difficult to find. The jack-in-the-pulpit shape stands 8” tall, as well. Marigold examples in this shape are more easily found. Smoke and white are other colors to look for. Four other versions of this vase may be seen in Imperial Vases – Part 5. Left - FREEFOLD in Amber. Almost 12 in. tall. Middle - Purple FREEFOLD Vase-12 in. tall - $95.4-10. Right - Marigold FREEFOLD -10.5 in. vase having 12 point star base. FREEFOLD Vase: While we display a lavender, purple & celeste example of this pattern in our Imperial Vases – Part 4 , we decided this particular purple example deserved a “front row seat”! It is GORGEOUS! This marigold vase is quite nice, as well. Amber is an “unusual” color in this pattern! Clambroth, smoke and white are also known colors. Seen in Imperial Glass Book by Archer's. Left - Marigold PILLAR FLUTE- 8 in. vase. Middle - Smoke PILLAR FLUTE- 8 in. vase. Right - Smoke #432 RANGER 8 in. vase. RANGER Vase: While the Ranger pattern is discussed at length in our RANGER ,BLOCK and BLOCKS and ARCHES segment, we have since been able to photograph this nice smoke example. This 8” pedestal footed vase has been verified as Imperial production. While many of the shapes within the pattern are found only in marigold, this vase is quite scarce in marigold, smoke and clambroth. PILLAR FLUTE Vase: These 8” vases are found in marigold, clambroth, and smoke. 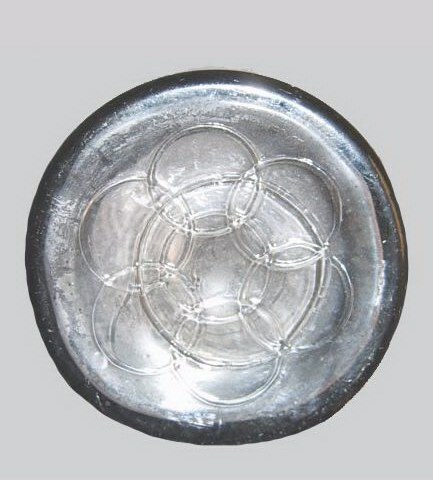 More than 30 shapes were made in non-iridized crystal, with only about half that many found in carnival glass. Imperial catalogs applied #682 as its designated production number. GOTHIC ARCHES: Although this pattern has been discussed and verified an Imperial production piece in our Imperial Vases-Part 4, where a smoke example is displayed; we are pleased that this marigold example clearly displays the interior design on the base of the vase. Occasionally, a vase having a slight additional “twist” appears. These have been termed such as “Curled Rib”, etc. 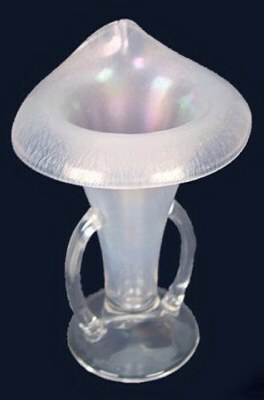 A “twist of fate” at times prevents the glass handler to maintain shape, should the item not have cooled sufficiently. 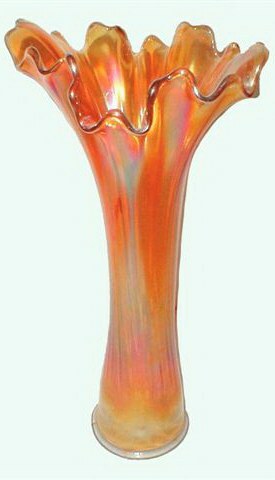 Imperial SWIRL vases - 8 in. vases found in marigold, clambroth, smoke and white. Left - SWIRL Vase enlosed in wicker. 8 in. tall x 3 in. base.-Ebay sale - $38. Right - Base design seen on some Smoke Imperial SWIRL vases. 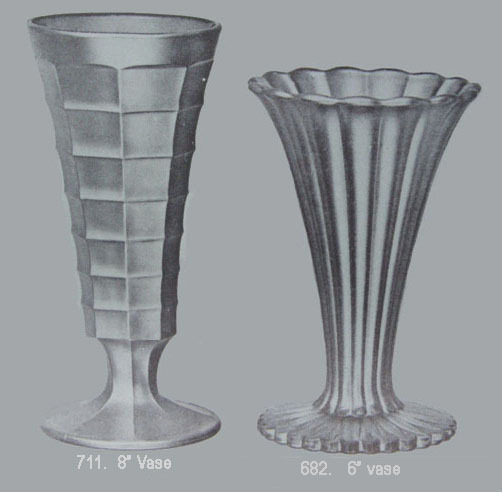 SWIRL Vases: The distinct lip found on the top surface of these 7”- 8” urn-shaped vases, perhaps indicates use of a lid? 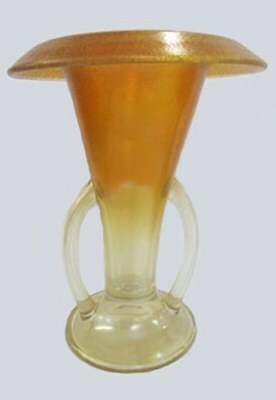 The base design is curious, along with the fact that although they likely were a transitional vase leading into the Depression Era, they do not appear to have been a “collectible favorite”. 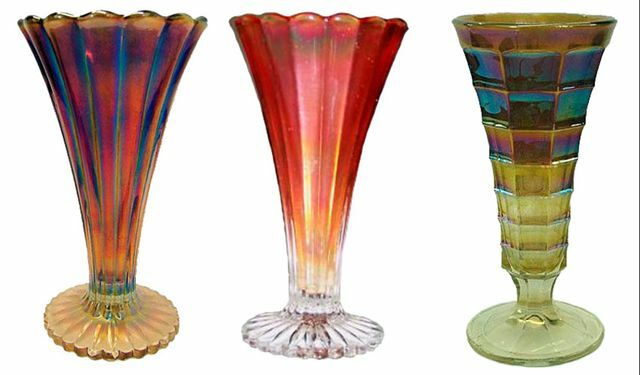 Few carnival glass collections exhibit an example in any of the four known colors! Marigold, clambroth, smoke and white are the colors to look for. (Note:) The vase having the woven basketry surrounding it, possibly indicates use by florists. “But the tax collector stood at a distance. He would not even look up to heaven, but beat his breast and said, ‘God, have mercy on me, a sinner.’ “I tell you that this man, rather than the other, went home justified before God.